It’s been another crazy week of non-cooking. Last weekend, I went to Maryland for a family visit, and to belatedly celebrate my dad’s 75th birthday. While I was away, Howard smoked a brisket and made a pot of baked beans, which is what we ate early in the week. On Wednesday, a mini-heat wave hit, so we just picked at various salads and cold food. 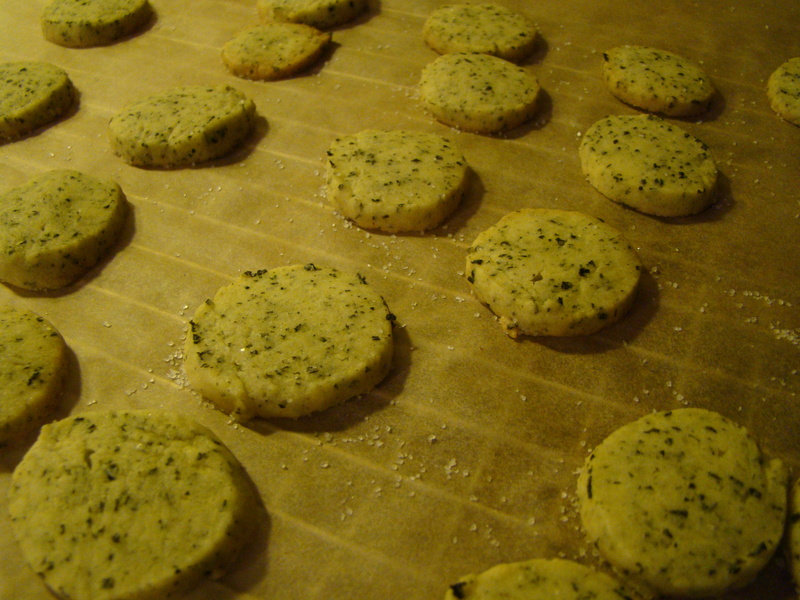 The only thing I managed to create out of my kitchen was David’s Seaweed Sables for French Fridays with Dorie. The process is similar to any slice-and-bake icebox cookie. 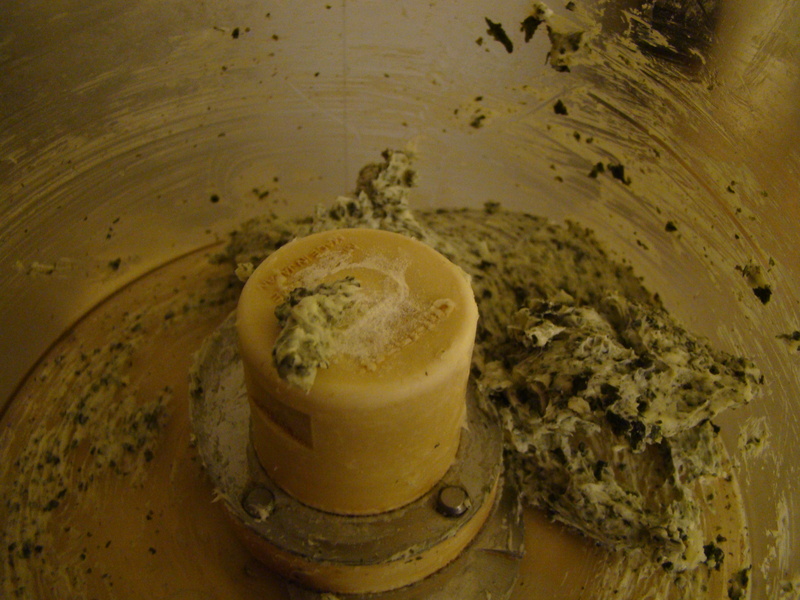 The dough is mixed, rolled into logs, and chilled until firm. The twist here is the addition of chopped seaweed. I took a shortcut with the seaweed. 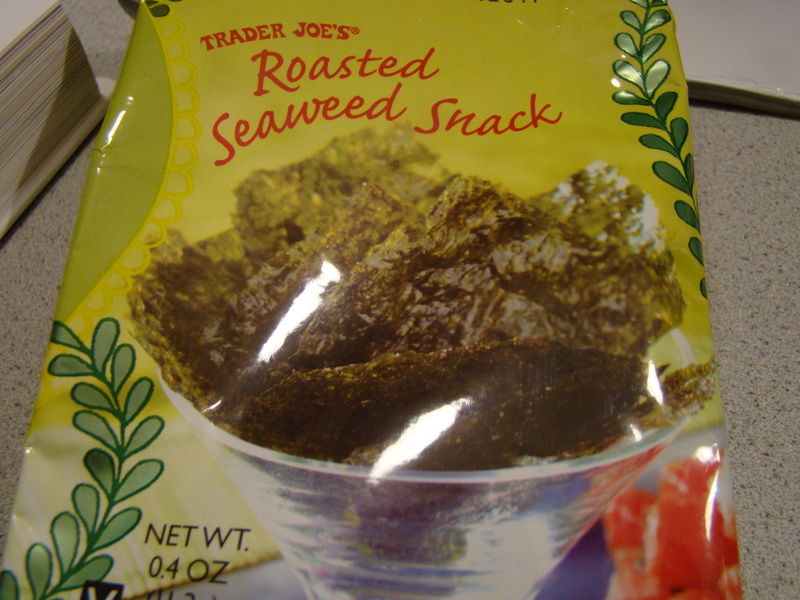 I had some of a favorite Trader Joe’s snack, Roasted Seaweed, on hand, so I chopped a package of that in the mini-chopper, and cut back on the salt because the seaweed was already well salted. It’s hard to categorize the end result. They are not sweet enough to be cookies, but too sweet to be crackers. Dorie calls them nibbles, perfect with cold white wine, still or sparkling, and I think she called it right. We’re going to try them as an accompaniment to cold soup for today’s lunch. I so love the convenience of homemade slice-and-bake logs. I sliced up one to enjoy now and stashed the other in the freezer for later. Of course, this particular recipe was unusual and interesting, but I’m not sure I’ll be rushing to make them again. I do like the idea of using savory ingredients to make other kinds of logs for homemade crackers. My mind is busy thinking up variations for another time. As always, I’m looking forward to reading about what my fellow FFwD bloggers thought about this week’s recipe. Check out their links at French Fridays with Dorie. We don’t post the recipes, but consider getting your own copy of the book, Dorie Greenspan’s book Around My French Table. Have a great weekend, all! Stay safely cool! Posted on 22 June 2012, in French Fridays with Dorie and tagged appetizers, French Fridays with Dorie, seaweed. Bookmark the permalink. 12 Comments. The sables were interesting, weren’t they? I agree that they almost fall into cracker land, but not quite. What a week for you! Isn’t it nice to have yummy things on hand so you don’t always have to cook? I liked these a lot, though maybe as much in concept as anything else. My leftovers have been surprisingly popular at the office… who knew? I had that kind of week as well. Over the weekend I made this week’s FFwD recipe and then during the week I made next week’s recipe (since I will be traveling next week). And really, those were the ONLY things which I cooked this week. No heat wave here though, just too busy. Some week’s Dorie is the only one who can get my into the kitchen. enjoy them, but I think I could do without the seaweed. Have a great weekend. Yes, I do think the concept here is too chic for my neighborhood! But I did like them but had trouble convincing others. Betsy, your seaweed sablés look very nice! You are right, it is convenient to make these slice and bake cookies and to freeze one log for later but I also agree that other savoury cookies/ nibbles seem to be more popular than these. The reviews were very mixed at our house. Hope you had a nice time in Maryland and enjoy the rest of the weekend! We really enjoyed these at our house, but I don’t know if I’d make a special seaweed trip to the store to make them again! Not much cooking except these and salads going on over here. It was hot here, too! We liked them, but I’m not sure they are a favorite. Hi, Betsy. I love the slice and bake logs as well and found a log of the cocoa sables in the freezer yesterday that I will bake off soon. :) I only made half of this recipe because I wasn’t sure we would like them, but we liked them especially me. I had them with some tea and enjoyed them that way because I loved the sweet/salty taste with the tea. Happy Belated Birthday to your dad! Hope you are having a fun weekend! I agree these were hard to categorize. I enjoyed trying them, but am also not sure I’ll be making them again. I really enjoyed these and so did my husband, even though I dreaded making them! I found them surprisingly delicious!! Glad you were able to get them done…I baked mine in a heat wave, too! So glad it’s cooled down! I’m glad you tried these. They look great!